We are family-owned and operated in Jeffersonville, IN. Our goal is to create an extended family ... a community of pet owners to enjoy the toys and treats that we personally select and pack each month. We pack every box with our own hands before it ships to your door ... we even sign it! 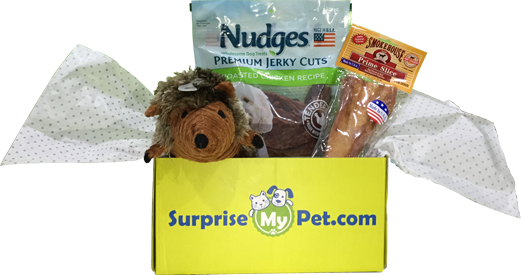 We use pictures of your pets on the insert cards in each box and on all our social media! We make our donations to pet-focused causes through YOU ... the subscriber! Surprise My Pet will be a reflection of our commitment to the love of all animals and their happiness. Treat your deserving companion to a box of goodies today and experience the joy on their face day after day! We are committed to the highest quality at an economical price so the enjoyment is available to everyone! We strive to create a community so that all of us are able to enjoy each other's relationships with our companions. We are committed to staying completely involved in the product selection and monthly packaging ... even if we need to stop growing in order to do so ... THAT IS OUR PROMISE!!! We will support the charities local to YOU and will ask YOU to personally deliver the donation. Learn more about the process Ready to get your box? For every shipped out box we take a portion to help our friends in need. Subscribe today and know you made a difference!